1. You can post using a Google, FB, Twitter or Disqus ID, or you can automatically register and comment by entering a valid email address. Your old Blogger ID should work on Google! 2. I have a "mixed" moderation in force here. Once you are a regular (or an irregular I know) here, your comments should go through seamlessly as time goes by. Initial comments will generally go to moderation. See below. Alter links by replacing html or http or www etc. with characters etc. NOTE: If you choose this option to circumvent moderation of inappropriate links, this is grounds for immediate ban. 5. My comments section tends to veer off topic from time to time, and when it does some of the best information has been shared. So I have always welcomed such veering. If the topic is potentially contentious and/or "out of the blue" please consider the post you choose for the comment, or re-consider whether email or Twitter would be better ways to go. I really don't know how else to say this but that OT is fine, and if I object you'll know it. Expect that posts may be deleted that might otherwise be well within these Guidelines if they cloud discussion of the main point. Also expect that said enforcement may be totally random. 6. Editing: I receive email notices of all comments on this blog. These will contain the original version of your comment after what appears to be a relatively short lag. If you edit your comment for anything other than typo/grammar correction please be courteous to everyone and indicate that you have done so. If I find you abusing the edit feature to either add content that violates my policies or delete content you thought the better of without acknowledging it, this is grounds for immediate ban. 7. Realize that this is NOT a personal blog. Badgering comments inquiring about personal details and such will be in violation of my comment policy unless the post is of a rare personal nature. DO NOT post links and ask "have you seen what so and so said about you on their blog" if it is even remotely derogatory. If you are concerned for me or my welfare, shoot me an alert in email. Problems?? Usually Disqus runs rather smoothly and I try to check the admin area fairly regularly. If you have an issue, you can try a test comment and just delete it or I will when I get a chance. As mentioned above, links are usually the culprit but also as Disqus is separate platform used across the internet, some will acquire "reputations" on other websites that may influence what Disqus does with some comments outside my control. Shoot me an email or a tweet to alert me! Navigation: In the hopes of seeing all new comments, use email notifications for this blog. It's tricky, but the best way I have found to respond to a comment is to click on "read more"
As you can see this brings you to Kitty's post, but with Man's right below. 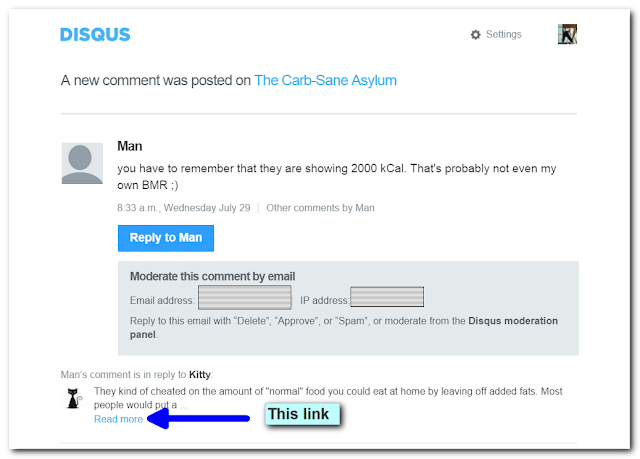 If I had clicked on Reply to Man it would bring me to the blog with the nested comments and sometimes this doesn't work as well as it should or it takes a while. 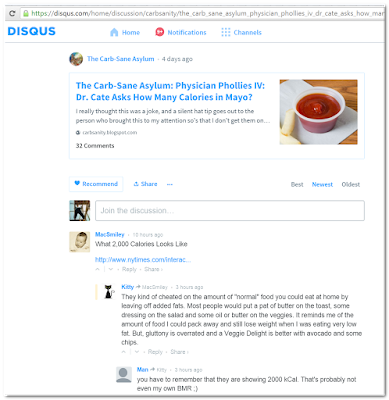 The Disqus dashboard is quick and uncluttered. Hope that helps!